Want to show the world your next great game? Do you have an amazing product that you need to get in front of new potential clients? Do you just really love talking to people? GDEX has some of the lowest costs for booths in the industry allowing for companies of all size to come in and showcase their products to our thousands of fans. GDEX now features an Artist Alley! Use our show's established platform of Gamers and Developers to sell your amazing artwork. We have an Artist Panel that goes through every application on a rolling basis, and accepts artists that we think are a good fit for the show! Make sure to apply early however, spots are limited and we try to accept only a few artists in similar areas to not over saturate the alley with simmilar products. GDEX is an awesome opportunity for networking, and Volunteering is one of the best ways to do that! 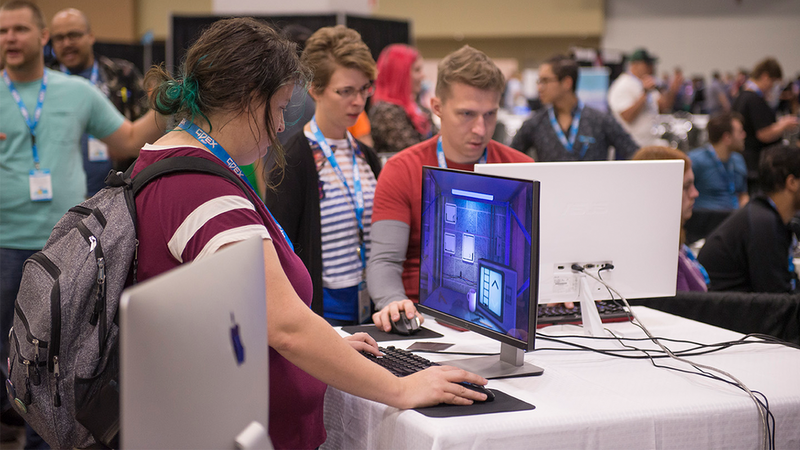 Meet other volunteers, help in the many facets of GDEX, and get a free pass to the show when you're not working! Last year GDEX hosted over 75 educational sessions throughout the weekend. Join the ranks of Industry Veterans, Media Personalities, and professions from all sectors of the industry to pass on what you've learned to our attendees. As a thank you, GDEX offers a Premier Pass to all of our speakers, allowing them to take a part in all events throughout the weekend! Apply for a press badge below or access our Press Kit to have everything you need to cover the Midwest's Premier Gaming Expo!